Ken Jeong can be a somewhat divisive figure. 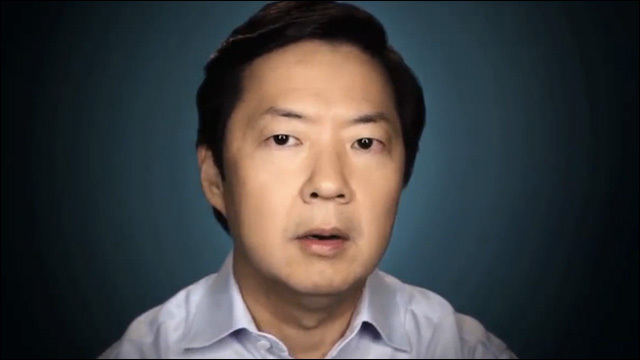 I've never been particularly fond of his career-making turn as Mr. Chow in The Hangover and its sequels, but I've always considered Ken Jeong an immensely talented performer. I'm looking forward to seeing him star in the title role of his own upcoming sitcom Dr. Ken. While The Hangover has never been my cup of tea, I have to appreciate the personal story behind Dr. Jeong's performance in that movie. When he was offered the part, his wife was battling stage three breast cancer, and he considered turning it down. But he took the role at the urging of his wife, who thought it could be therapeutic. You can't help but get a little emotional watching that clip of Ken Jeong accepting the trophy for "Best WTF Moment" at the 2010 MTV Movie Awards. Unexpectedly, at the heart of this bizarre and wildly inappropriate movie character, is a sobering, loving and hopeful human moment. Respect.